Phaedra Boinodiris, IBM’s global lead for serious games and gamification at IBM served as CUBE’s 2016 social entrepreneur-in-residence. Since the start of her career at IBM, she has incubated a game development ecosystem on IBM’s cloud and IBM’s first serious games practice, solving complex problems across industry. She is also the author of Serious Games for Business, published in 2014 by Megan-Kiffer Press. Boinodiris’ earlier work in serious games is being used in more than 1,000 schools worldwide to teach students the fundamentals of business optimization. Boinodiris was honored by Women in Games International as one of the top 100 women in the games industry. Prior to working at IBM, she was a serial entrepreneur for 14 years and co-founded womengamers.com, a popular women’s gaming portal. There she subsequently started the first scholarship for women to pursue degrees in game design and development in the United States. In November 2015, Boinodiris was elected as a member of IBM’s Academy of Technology and has six patents in the gaming space. 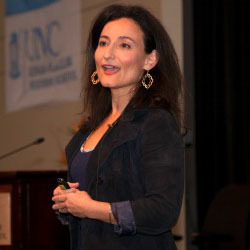 She happily mentors business school students at her alma mater UNC-Chapel Hill.